Dispensationalism is a complicated system of belief about the "last days," the Jewish nation, the millennium, and other related subjects. This system is extremely popular and heavily promoted in North America. I will show below that this system is built on false assumptions about the Scripture. If ANY of their assumptions are wrong then their entire system collapses like a house of cards. Note: In this short report there is not enough space to go into great detail. You are encouraged to check these claims out for yourself. Also we look at dispensationalism in greater detail in our Death and Beyond Course. Dispensationalism assumes God deals differently with people in different time periods called dispensations [hence the name]. 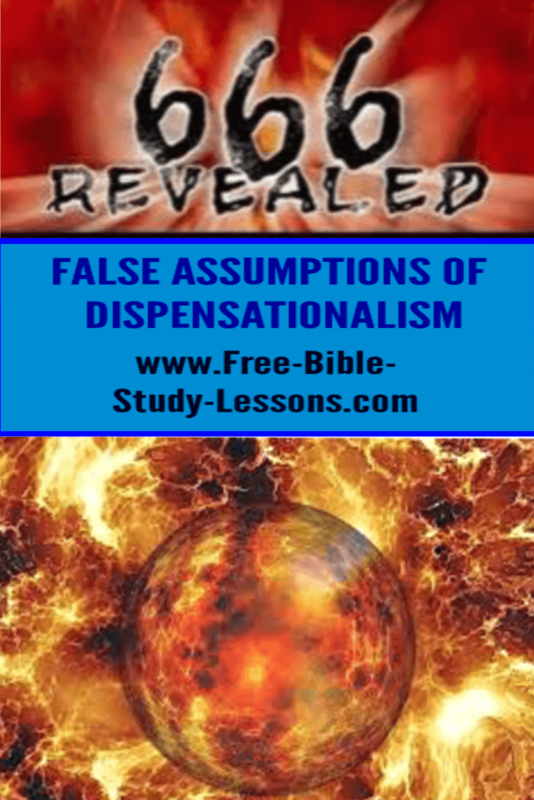 Although there is some disagreement among dispensationalists, most agree that there are seven distinct dispensations. The dealings of God with mankind are seen as separate - with perhaps some overlap. Is God's plan really broken up into different ways of dealing with people at different times? This is a dangerous assumption to make because it means that God is unpredictable. He has had different unrelated plans in the past and may then have different plans in the future. It also means that salvation in some of these dispensations was possible without the cross. Some people are saved, in this view, simply because of their national heritage. One God means one plan for all time and eternity. There is only one way to God: Jesus Christ. The Old Testament saints looked forward in faith to what Christ would do on the Cross and we, in the New Testament era, look back in faith to what He did do. As we study in detail in Covenants, God does not have separate methods of dealing with people in different dispensations, instead He has one unfolding plan revealed in different stages. Each stage builds on the one which has gone before and expands it. Dispensationalism assumes there is more than one way to God. In particular, the natural Jews are seen as God's special people and are saved because of who they are, not because of Christ's work on the cross. Some go so far as to imply that if the Jews had accepted Jesus the cross would not have been necessary at all. Without Christ's shed blood no one could be saved: Jew or Gentile. The atoning death of Christ was God's plan from the beginning of the world. Dispensationalism assumes that God has not yet fulfilled His promise of Land to Abraham. God told Moses that He was about to give the land to the children of Israel as He had promised. Scripture records that God fulfilled His promise to Abraham under Joshua. Israel possessed the land a SECOND time under David and Solomon. To say that God has not yet fulfilled His promise to Abraham is to deny to plain teaching Scripture. In fact, God gave it to them twice as confirmed by Scripture and perhaps once again - not confirmed by Scripture - under the Macabees. God kept His promise! 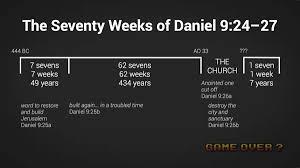 Dispensationalism assumes there is a gap in the image in Dan. 2. For some mysterious reason the feet are disconnected from the legs. Daniel did not see this. He saw a complete image - no gap between the legs and the feet! Do you see one in the Scripture? Why would the Dispensationalist place a gap here? The only reason is to make Scripture fit into a prophetic agenda. This beautiful picture of the kingdom of God [stone] being set up in the days of the Roman empire [at the death and resurrection of Christ] and growing until it fills the earth is twisted and distorted for sensationalistic thrills. Dispensationalism assumes there is a gap in the Seventy Weeks. Look at this verse. Look at the context. Is there a gap? Did not God say 70 weeks ARE determined? Did He say 69 plus gap will make 70? Of course not! My God knows how to count. 70 follows 69. Almost everyone agrees that the 69 weeks brings us to the time of Christ. The 70th week is then the time of Christ's ministry. If you look carefully at the above list you will see the Jesus did it all. Dispensationalism assumes the prince of Dan. 9:26-27 is a future antichrist. They teach that the antichrist, who is the prince, will confirm a covenant with the Jews, etc. They assume that "he" refers to the prince. A pronoun refers to the subject of a sentence. The subject of the previous sentence is the Messiah not the prince. It is the Messiah Who will confirm the covenant, etc. There is no way grammatically that "he" can refer to the prince - which is in a prepositional phrase. Look at the above verses. Jesus confirmed the covenant - He said He came to minister to the lost house of Israel. His death on the cross ended the need of all the other sacrifices, etc. Dispensationalism takes the beautiful, holy work of Christ on the cross and credits it to some future antichrist! Why? So they can keep their system of prophecy intact. By the way, twisting this Scripture is the only way they can get a seven year tribulation which is so important to their beliefs. Dispensationalism assumes there are two Second Comings. They make a great difference between Christ coming WITH the saints and Christ coming FOR the saints. They sometimes try to avoid this problem by saying it is two stages of the same coming. However, two stages separated by 7 years IS two different comings. Study the Scriptures on the subject of the Second Coming and you will see that there is only one Second Coming. Some Scriptures only deal with one aspect of the Second Coming, but when you look at the big picture you see only one Second Coming. Dispensationalism assumes that "this generation" in Matt. 24:34 was not the generation to whom Jesus was speaking. Interestingly, Dispensationalist Thomas Ice admits that every other time the word "generation" is used in the book of Matthew it means the generation then living. But in Matt. 24 it can't mean that, it must mean a future generation that sees the predicted signs beginning to happen. Why is that? Because if Jesus actually meant what He said then all those prophetic signs would have already happened and could not be in the sensationalistic future. The entire dispensationalist vision of terrible future tribulation would be destroyed if Jesus seriously meant what He said. If Jesus had meant a future generation He could easily have said "the generation which sees these signs begin" but He didn't. Dispensationalism assumes that words in Revelation like "quickly" and "soon" do not mean something is going to happen in the immediate future. Like assumption eight, the dispensationalist believes he knows what the author meant instead of looking at what he said. They claimed that the references in Revelation to things happening quickly really mean that when the events begin to happen they will happen quickly. If that is what the writer had meant to say, he could easily have said it that way. He didn't. Dispensationalism assumes that natural Jews and national Israel are the center of God's plan. Christ is replaced by the Jews. Examine some of their charts and you will see it is all about Jews. Jesus is a sidelight. Does God love the Jews? Of course, but Paul makes it very clear in Romans and elsewhere that the natural Jews no longer have any special place in the plan of God. What was the purpose of the Jewish nation in the Old Testament anyway? It was to be the womb through which Messiah would be born in order to bless the nations! A world-wide church was always the goal. The Jewish nation was a valuable and necessary instrument in accomplishing that goal. And if they had remained faithful to God as a nation there would have been great reward instead of AD 70. God is not a racist, all nations are now and forever welcomed into His presence through Jesus Christ. This report is not intended to question the sincerity of anyone's faith. Most dispensationalists love God. They are Christian brothers and sisters. However, their system of belief about these things is, I believe, a dangerous error. If you look at the implications, dispensationalism devalues Christ and the cross among other things. As you examine these things, search the Scripture with an open mind to see if these things are so or not. We are required to reject every teaching - no matter how interesting or popular - if it is not grounded firmly in Scripture in context. Dispensationalism, in my opinion, distracts Christians and motivates them to waste time, energy and money in a false direction rather than in expanding the Kingdom of God.